Governor Ayodele Fayose has criticised President Buhari for supporting Kaduna state governor, Nasir El-Rufai's plan to sack 21, 780 teachers that failed the state competency test in October. Recall that President Buhari backed El-Rufai's plans to dismiss the teachers when he spoke at an Education summit in Abuja yesterday November 13th. 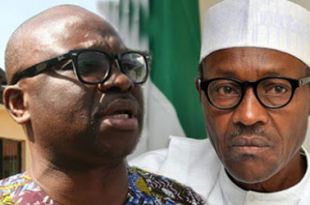 In a statement released by his Special Assistant on Public Communications and New Media, Lere Olayinka, Fayose said it was sad that President Buhari, whose government promised to create jobs for Nigerians, is supporting throwing of about 22,000 teachers to the labour market after causing loss of millions of jobs in the private sector and collapse of several companies. He said the President’s position was a pointer that labour leaders in the country should prepare for mass sack of workers by the APC governments both at federal and State levels. “Here in Ekiti State, the immediate past APC government used competency test to demote many secondary school principals, vice principals and primary school head teachers, leading to sudden death of many of them. The government then tried to force the competency test on the teachers but they resisted. “Today, students in Ekiti State are still being taught by the same teachers that the APC government said were not competent and the students were the ones whose performance gave the State first position in NECO in 2016 and 2017. The State also moved from 26 percent performance in the West African Examination Council (WAEC) examination in 2014 to 36.5 percent in 2015, 42 percent in 2016 and 74.86 percent in 2017. “Therefore, instead of hiding under competency test to sack teachers, the APC government both at States and federal government levels should come to Ekiti State and learn how we were able to get optimum performance from the same set of teachers the immediate past APC government in the State labeled incompetent and harassed with competency test. While declaring that it was not the right of any state government to set exams for teachers, Governor Fayose said; “The Teachers Registration Council of Nigeria was set up for the purpose of regulating the teaching profession in Nigeria.